CHESTNUT HILL, Mass. – Mike Compton tossed five innings and scattered three hits to earn his fourth victory of the season as No. 7 Florida State (19-6, 7-1 ACC) completed a 3-0 shutout victory over Boston College (14-10, 3-7 ACC) on Friday afternoon. Compton (4-1), who didn’t allow multiple hits in the same inning, yielded only three hits and three walks as he held the Eagles scoreless. He was followed out of the bullpen by Jim Voyles who went three innings, facing the minimum nine batters, and finishing with one strikeout. 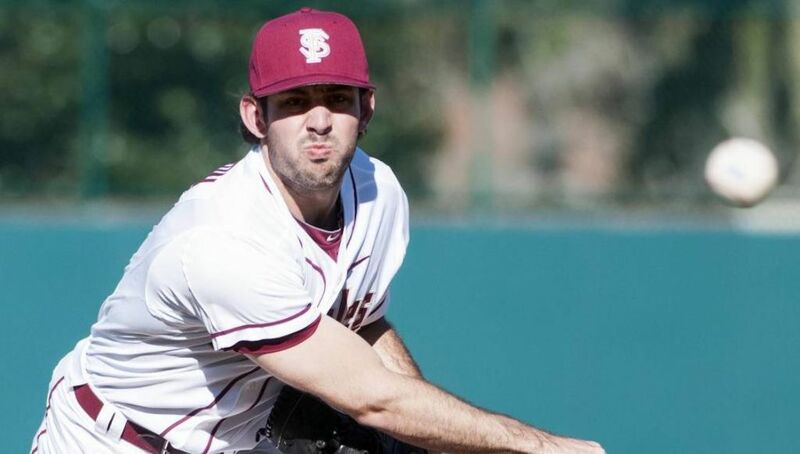 Seminole closer Tyler Warmoth (S, 2) took over for Voyles in the ninth and converted two strikeouts to preserve the first shutout for Florida State since a 6-0 victory over Louisville on May 23, 2015. Jackson Lueck was the lone Florida State hitter in the lineup with multiple hits after finishing 3-of-4 with a double and two singles. He also scored one of three Seminole runs in the contest. Joining Lueck with solid performances from the plate were Ben DeLuzio (1-4, RBI, double) and Taylor Walls (1-4, RBI, double), who extended his career-long hitting streak to 13 games. After only two Florida State hits in the first four innings, Matt Henderson extended the top of the fifth inning with a two-out single to the right side of the infield. That was quickly followed by a double into left by Walls plating Henderson from first for the 1-0 advantage. Lueck opened the Seminoles’ ninth by lifting a double off the right centerfield wall. Two batters later DeLuzio followed with a double into left field, scoring Lueck on the play, as FSU assumed the 2-0 lead. A fly out to right field by Darren Miller moved DeLuzio to third before an error at third base, during the Henderson at-bat, allowed the speedster to score the third Seminole run of the game. Florida State continues its series with the Eagles Saturday at 11:00 a.m. Seminole fans can always stay up-to-date with the Florida State Baseball team by following the official twitter page of the Seminoles (@FSUBaseball).